That’s right, it’s been a good spring for the Engelmann daisy, Engelmannia peristenia, the wildflower you got a good look at yesterday. Above you see a flourishing colony of Engelmann daisies along Gattis School Rd. in Round Rock on April 16th. The white flowers are old plainsman, Hymenopappus artemisiifolius. In the back left you can make out some bluebonnets, Lupinus texensis, and greenthreads, Thelesperma filifolium. Below is a little closer view of a part of the Engelmann daisy colony. Did you know that Engelmann in German means Angel Man? That’s a doubly hearty response. Steve, is that in the area that used to be known as Mokan Prairie? By the way, I was out with friends on Sunday and noticed that the mowers have pretty much controlled themselves other than here on CR11O & south toward Chandler Rd./University Blvd/FM1431. The property shown in today’s post was maybe 1500 ft. further east on the south side of Gattis School Rd., across from Via Sonoma Trail. I took pictures on five flowerful properties along Gattis School Rd. that day. I haven’t gone back in the three weeks since then to see what those properties are looking like now. I know you said you hadn’t been there in years, but you may want to go by and check it out. Mowers controlling themselves is always good—and unexpected—news. As with the Englemann daisy, so with plains coreopsis. It’s just unbelievable how widespread those flowers have become in my area. Imagine the Broadway cemeteries multiplied by a few thousand acres. It’s wonderful that you can have a different flower, but the same effect. In the second photo, I seem to see a bit of purple in the upper left, too. Purple and yellow or gold seem to appear together in so many combinations I’m not surprised. Prairie verbena, perhaps? Or some spiderwort? 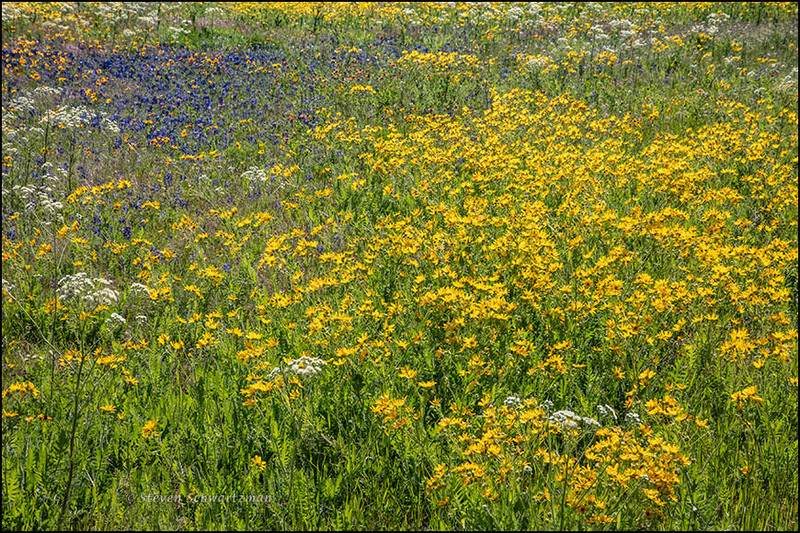 I’m glad to hear that plains coreopsis is having a good time being coastal coreopsis as well. How nice that you have thousands of floral acres to play around with, an extrapolation from the Broadway cemeteries in Galveston. 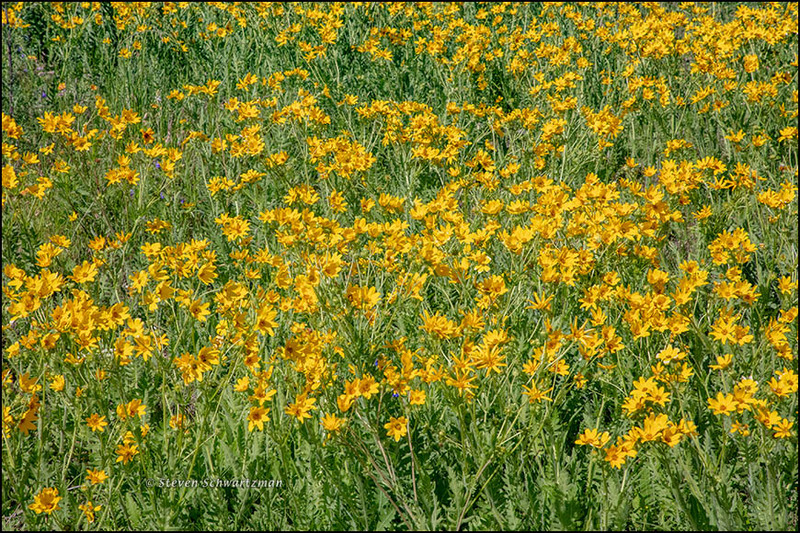 If that continues, maybe you can get people in your area to hold an annual Coreopsis Carnival to celebrate spring wildflowers. You are eagle-eyed. I hadn’t noticed the contrasting color in the upper left. I enlarged the original and can say that the purplish color is not from spiderworts or verbanas, but something in the mint family, perhaps a skullcap. There’s not enough detail to be more specific (which is the right word: make it down to the level of a species). I like how you show the plant as a member of its colony, and as the colony fits into the tapestry. Call it a mix of biography (the previous post) and sociology and anthropology (this post). Things are starting to happen around here. I went to a bottomland woodland yesterday and it was covered in sheets of large white trillium, red trillium, spring beauty, blood root and several others, all lapping at the trunks of numerous trees. It was glorious and I wished you were there to document it! From what you say, I’d be wandering around like a crazy man—but then some would say it doesn’t take wildflowers for that. You’ll have to enjoy it for me. I expect new paintings to come from what you’ve been seeing. A carpet of warm yellows! A carpet of sorts, but I hope not one that people will tread on. It must put a spring in your step to see all these lovely flowers. The spring in my step followed a rather late spring in nature here this year. Apparently due to rainfall, flowers this season were generally better east rather than west of Austin. The strange thing would be if, as a German, you didn’t know that. If I happen to know something like that, I mention it for the sake of my overwhelmingly English-speaking readers. Was ‘Angele Man’ from Los Angeles? That would have been an appropriate place for him to visit. Near the end of his life he visited the forests of the Pacific coast but I don’t think he made it as far south as Los Angeles. Some of the most interesting coastal flora happens to be in Los Angeles County! I’ll have to pay attention the next time I’m there.